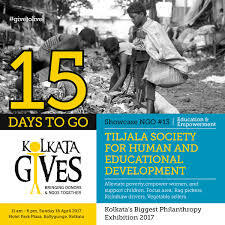 On 16th April 2017 Tiljala SHED was privileged to be one of the 15 NGOs chosen to exhibit at the prestigious philanthropic Kolkata Gives event at the Park Plaza Hotel. For the 4th year running a group of Kolkata-based philanthropists have provided a forum to bring together credible NGOs and potential donors. The brainchild of Mudar Patherya, journalist and social activist, Kolkata Gives, also works throughout the year providing capacity building support to NGOs through workshops and other programmes. Tiljala SHED is the only NGO exhibiting this year to have been selected for three consecutive years and is proud and delighted to be able to show our work and share our stories. Mudar Patherya writes: Kolkata Gives was started in 2013 with a simple objective: connect prospective donors with willing NGOs. Because willing donors often did not know of credible NGOs- and vice versa. In so doing, Kolkata Gives did not merely connect the haves with the have-nots. It championed the cause of generosity. We had a great day and made dozens of new connections. We are especially delighted that so many visitors to our stand want to visit our projects. We are looking forward to welcoming them.